Reef-building Staghorn Corals are among the fastest growing corals on the reef; when healthy their branches can grow up to 8 in a year! They were once very abundant, but their population has declined by over 80% since the 1980’s, with no signs of recovery. Staghorn Corals are so named because their branches look like antlers. They some of the fastest growing corals and one of the most important in the Caribbean, having played a central role in the formation of the reefs over the last 5,000 years. They provide habitats for a diverse range of marine life and if in good conditions, can live for hundreds of years. Staghorn Corals may look like plants or rocks, but they are actually animals. What we call ‘corals’ are made up of tiny animals named polyps. They can be as small as a pinhead or as long as a dart in diameter, and they group together to form large colonies. They then secrete a hard calcium carbonate shell, which gives them their ‘coral like’ appearance. Where are Staghorn Corals found? 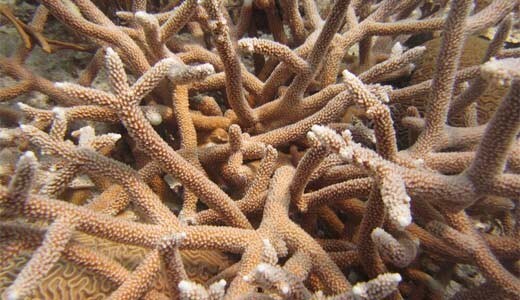 Staghorn Corals live on coral reefs throughout the Bahamas, Florida and the Caribbean. They inhabit clear waters and are typically found at a depth of 15–60 ft (4.5–18 m). What do Staghorn Corals eat? Like many corals, Staghorn Corals have a symbiotic relationship with single-celled algae called zooxanthellae, which live in the polyp tissues. They produce nutrients through photosynthesis which they then pass to the corals. These nutrients are their primary food source, but Staghorn Corals also prey on microscopic animals known as zooplankton. Being static, they wait for prey to come to them and then catch them using stinging cells, known as nematocysts, present on their tentacles. How do Staghorn Corals reproduce? Staghorn Corals are hermaphrodites, so have both male and female reproductive organs; they reproduce in two ways: sexually and asexually. Sexual reproduction occurs once a year in late summer, and it is quite the event to witness as eggs and sperm are mass released into the water column all at once. While each colony produces both sperm and eggs, they don’t self-fertilise, so sperm released from a different colony fertilises the eggs. The fertilised eggs then develop into larvae before settling and forming new colonies. Are Staghorn Corals preyed upon? Staghorn Corals are fed on by nudibranchs and are also prey for butterflyfish, which target polyps as well as worms and other small invertebrates. It’s also not uncommon for certain species of fish, such as parrotfish, to bite off parts of the coral to reach prey hiding within. What are the biggest threats to Staghorn Corals? Staghorn Coral is listed as Critically Endangered on The IUCN Red List of Threatened Species. 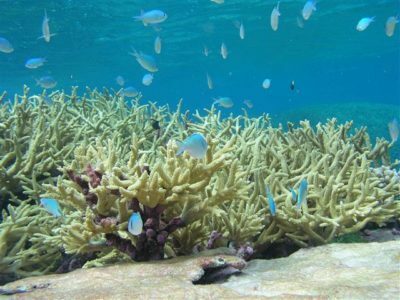 Climate change and the associated rise in sea temperature is the biggest threat to Staghorn Corals as changes in temperature can cause bleaching – when corals expel their zooxanthellae into the water column. This not only causes them to lose their primary nutrient source but also their colour as it is the zooxanthellae that are responsible for the beautiful colourings. Without them, they are white. Staghorn Corals are vulnerable to extreme weather events, which are on the increase as a result of climate change, and are easily damaged by hurricanes. They are also susceptible to disease, which can spread quickly and kill off entire colonies, and at risk from ocean acidification, invasive species and direct contact with humans, mainly through the fishing industry and tourism. What is the future for Staghorn Corals? While overall numbers of this species are dropping, certain populations are holding steady. This provides hope that they can recover if we look after them. Many of the populations are living in protected habitats, and there are management plans in place in currently unprotected areas. Some organisations are also growing Staghorn Corals in nurseries before planting them in the wild. While the future of Staghorn Corals is uncertain, possibly bleak, with time and dedication it may be possible to restore them to their former glory.